A quick workout, parking problem solver, kindness to the environment, time saver—Many workers across the country are turning to a two-wheeled approach for their daily commutes. 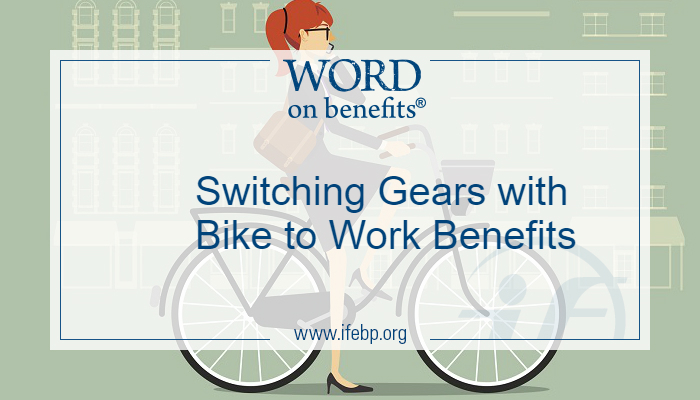 With National Bike Month well underway, my colleagues and I investigated what workplaces across the country are offering for bike to work benefits. According to the Transportation Benefits and Incentives survey report from the International Foundation, one-third of employers currently offer benefits/incentives to encourage employees to bike, walk, carpool or use mass transportation for traveling to work and, on average, 8.2% of workers take advantage of biking benefits and incentives. Biking to work is popular among 15% of workers (cars, rapid transit and city bus are more common). Though biking is not the most popular of all commuter choices, the number of people who bike to work increased by 51% from 2000 to 2016, according to the League of American Bicyclists. Workforce Wellness online course—Many employers take an active role in supporting employee wellness because improved quality of life positively affects overall productivity, health and stability of the workforce. The key to long-term success is building a culture within the organization that encourages and supports health and healthy behaviors. The law has recently changed for employers offering bicycle commuting benefits. Employers previously were allowed a deduction for the cost of qualified transportation fringe benefits provided to employees, including bike commuting. With the enactment of the 2017 Tax Act, bike commuting reimbursements can no longer be excluded from gross income and wages. This means that employer reimbursements for bike commuting expenses are taxable and subject to payroll taxes and income tax withholding. While employers may be evaluating their biking to work policies in light of the tax law, attracting and retaining talented workers is the main reason organizations offer incentives for transportation methods like biking. The second most common reason is response to worker requests. Organizations said their workers choose their specific mode of transportation based on convenience, commute length and cost. To review the findings of this survey, visit www.ifebp.org/transportationbenefits.